Do you think you might like a career in research or go to graduate school? 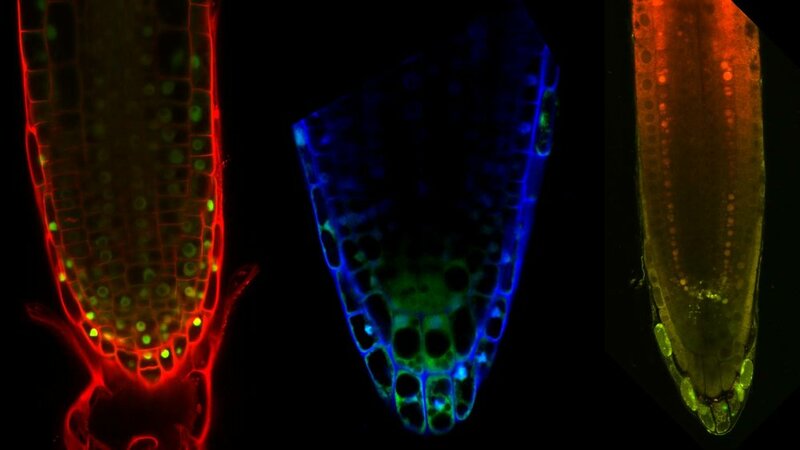 Confocal laser scanning images of roots expressing fluorescent proteins (GFP) and redox sensitive GFP and stained with fluorescent dyes for flavonoids, cell wall or reactive oxygen species. You can learn how to do this! We have a variety of projects that range from basic research in biochemistry, cell biology and molecular biology to applied research including field trials in horticultural crops. Students become a real member of the lab they work in and are guided by a faculty mentor assisted by postdoctoral researchers or senior graduate students. We make a particular effort to provide students with the opportunity to gain hands-on experience with cutting edge technologies such as spectral scanning confocal microscopy, mass spectroscopy, high throughput DNA sequencing, gene chip transcriptomic profiling, and proteomic technologies. Summer researchers will learn how to plan and perform experiments, record their experimental results, and prepare data for publication. At the end of the program, students will also present their work in a short talk – just like the short talks grad students and post-docs present at national and international scientific meetings. The summer internship program is tailored to each person research interests with options for 4 to 8 week research experiences. Participants receive a stipend based on the amount of time spent with the program. Travel costs are also covered for student participants from institutions other than University of Maryland. University of Maryland students can choose to receive course credit; students from other institutions need to arrange course credit with their counselors at their home institution. If you are interested, please contact Wendy Peer wapeer@umd.edu 301-405-5491. Students are usually asked to prepare an informal application and to provide one or more letter of recommendation from current or past instructors. Applications received before March 31st of each year are given priority consideration. Summer fun at the University of Maryland in the greenhouse and in the lab!